How to use the "Waiting for" filter? Waiting For filter allows you to list contacts that you've already contacted and currently waiting for them to call you back. Open your Contact and enter a Next Action (see A). Select Waiting for from the drop down (see B). 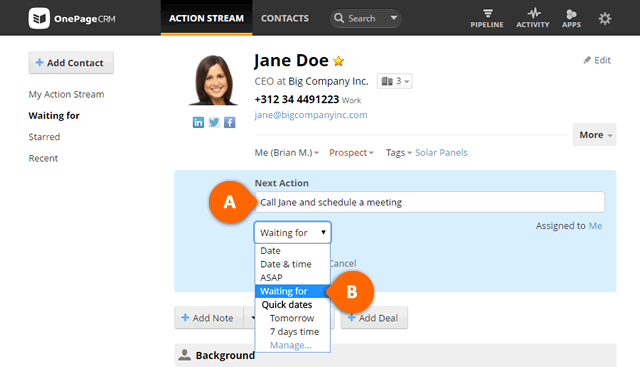 How to view your Waiting for contacts? Click on the Waiting for filter on the left hand side menu (see C). Contacts are displayed in reverse chronological order starting with the shortest stale indicator e.g 0 Days and ending with longest stale indicator e.g > Mth (see D). To view details of a waiting for contact, click on it and their contact details are displayed with the flag specifying the duration of stale indicator e.g Waiting for 4 days (see E). The stale indicator refers to the period from the time stamp the contact was assigned the Waiting for up to now. This indicator ranges from 0 Days to 6 days, 1 Week (Wk) to 4 Weeks (Wks) and when the waiting time exceeded 30 days it displays waiting over a month (> Mth). To apply the Waiting for to a contact click here.